Our feet carry us through our lives and we often don’t give them a second thought until there is a problem. Perhaps a bone spur, a bunion, arthritis, plantar fasciitis, or a sprain, start to slow us down. A foot soak is a simple and economical way to help resolve these conditions or enhance any treatment such as acupuncture and physical therapy. The heat increases circulation and brings fresh blood to the areas of pain so that the tissues can repair and heal. Acupuncture works by a similar mechanism to decrease pain. People often forget about using heat to treat these conditions because we have been taught to put ice on the area. However, it is best after the initial injury, such as a sprained ankle, to alternate with heat and cold on the affected area. Conditions such as arthritis where there is stiffness and pain, especially the type worse with cold and damp weather respond very well to the warmth of a foot soak or hand bath. In Chinese medicine we look at each individual holistically. We look at the balance of hot and cold within the body. For optimum health these temperatures needs to be in balance. Many people, who work in cold spaces such as in or near refrigerators used for food processing, cooks, and florists, may be exposed to an unnatural amount of artificial cold. Even office jobs where there is air conditioning blowing can be detrimental for some individuals, especially if it is focused on a certain area like the feet or neck. Overtime, this cold seeps into the body and can cause problems. A hot foot bath is a great way to mitigate this and also soothes tired feet. Insomnia and anxiety are two other common conditions that respond very well to a hot foot bath before bed. This is not obvious, and many people are surprised to hear this. The heat helps bring excess energy down from the mind and relaxes the nervous system to encourage a state of calm and bring deep sleep. Adding epsom salts which are available at most pharmacies are a great way to enhance a hot foot soak . I recommend ½ cup per foot soak. 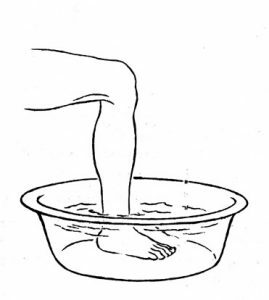 For the foot bath fill a dish basin about ⅓ of the way with hot water, or enough water to submerge your feet. The temperature should be similar to that in a hot tub or hot bath. Keep a towel close by to dry your feet with when you’re done. Spend at least 10-20 minutes or until the water has cooled significantly. A few drops of essential oils can also be added to the foot bath. Lavender essential oil is great for stress, anxiety, and insomnia. Lavender, helichrysum, and frankincense are helpful for soft tissue injuries. Rosemary, peppermint, and ginger for arthritis. Some companies make blends for specific conditions you can buy and add to your foot bath. Integrative Acupuncture in Montpelier and Williston has begun to offer herbal foot soaks for home care for specific conditions. Home care with herbal foot soaks involves cooking the herbs at a slow simmer and then adding white vinegar to the mixture. Next, soak your foot or feet into the warm water for at least 15 minutes. The herbal soak can be saved and reused 6-8 times after refrigeration and gently re-warming it. 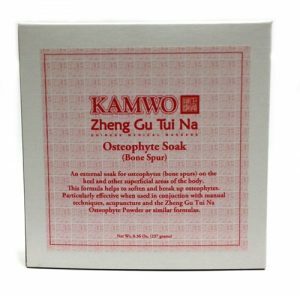 Chinese herbs selected by your acupuncturist that are tailored to your condition are yet another way enhance a foot bath and effectively treat a number conditions. Remember, our skin is the largest organ of our body. The heat, minerals and herbs that we absorb through the skin of our feet have a local and global effect on our body and emotions. Our bodies heal and rest best when we are relaxed so take a load off, and plunge in.